In case you missed the post, here is information on our Manor Shed – which is a lovely upscale garden shed that is sure to add value to your property. Manor Shed – Estate Series upscale sheds from Fox’s Country Sheds. What size shed is right for you? When you are shopping for a storage garden shed, you will need to consider what size will work best for your needs. Fox’s Country Sheds builds all sizes of sheds and garages, so it’s not a matter of what you will find available from us on our website or on our lot. But rather, what size will fit in the space that you have, and what size will sufficiently store your possessions. A 4×6 shed is quite small, but if you don’t have much room and only need to store a few hand tools, it might be the right size for you. Keep in mind, though, that you might outgrow it quite soon! Personally, I would not recommend anything smaller than an 8 x 10 for simple storage in a relatively small space. Every style of shed that we build, whether it has vinyl siding or is built of painted wood siding, is available in a 8 x 10 shed size. An 8 x 10 shed will give you enough room for a mower – possibly even a riding mower. Be sure to measure the width of your mower before ordering your shed. As a standard, an 8 x 10 shed will come with a 4-Foot wide double door. Be sure this is sufficient for easily maneuvering your mower in and out. If you need a larger door – no problem. But, we need to know ahead of time! If you are planning on including a workbench or potting bench in your shed – and many of our customers find them very useful to have – keep in mind that the typical width for such a bench is 2-ft. So, when ordering your garden shed, be sure to include enough room for you to walk around work around the workbench, while still leaving room for storing your mower, snowblower, rakes, etc. If you need a different size workbench or potting bench – no problem! Just let us know at the time you place your order. Some people ask what the ‘average’ size is that most people buy. It really all depends, but a 10 x 14 or 10×16 shed can be an ideal size for most homeowners. Some even go as large as 12 x 20 or larger, assuring that all of their needs are met for many years. This will leave you with plenty of room for the rider or a small tractor, kids bikes, snow removal equipment, as well as lawn care equipment. Many homeowners want enough room to store their valuable patio furniture during the winter months. If you prefer to be able to “drive through” your shed, you might want to add a second set of double doors on the opposite end. We also highly recommend a ridgevent or gable vents – something for ventilation, especially if you are storing chemicals or gas-powered equipment. Hey, your stuff cost a lot of money, and you want to be sure you have safe and secure storage to keep your valuables clean and safe! We completely understand this, and all of our sheds come with a locking latch and a set of keys. It’s a good idea to keep one key in a safe area in your garage for easy access, and the spare key tucked way in a secure location in your home in case you ever lose the first key. Should you lose both of them (and we get many calls from folks that do), we can order a set of keys for you. Now that you have considered what size shed would fit your needs best, it’s time to decide on where you want to place your shed. This, too, will vary from homeowner to homeowner. Some people like to keep their storage shed right near their back door or garage door for easy access. Others like to place them in the farthest corner of their yard. Whatever suits your needs best, be sure that we have adequate clear space to deliver and place the shed in your designated spot. Sometimes it’s a good idea to draw out a map of your property which indicated where your house is, where your property lines are, and where any trees, bushes or shrubs, wires or poles, stationary basketball nets or playsets, fences and septic or drainage beds, etc., are located. This will help us map out whether we can easily delivery the shed to the location in the yard that you have selected as your first choice. You might want to keep a second choice in mind, just in case the first location is not readily accessible to a delivery trailer. Any questions about selecting a Shed size? Please feel free to contact us directly at www.FoxSheds.com ! Remember that we ship right to you! Well, let’s say that now that you have your backyard storage shed – you need to put things away in it in an organized manner. And keep it that way. Sometimes that is easier said than done. Here are some ways that Fox’s Country Sheds suggests that you can organize your tools and equipment in your backyard storage shed or garden shed. A wall of crates creates a unique storage solution for your shed. cubicles. 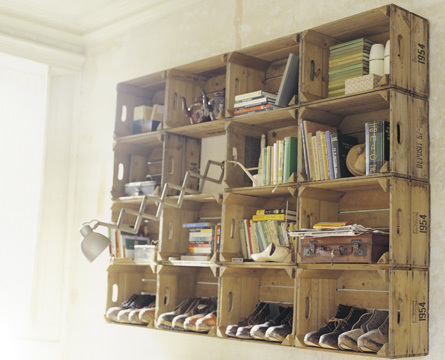 Take a look at the photo on Design Squish that uses stacked crates to create a wall of storage. You can easily adapt this use in your garden shed as well. This makes an ideal solution for keeping garden equipment separate from household tools. One crate can keep open bags of grass seed safely contained while another can keep power tools out of reach of youngsters. Use your imagination and space in any way that they will fit alongside the walls of your shed. The nice thing about this solution is that you can use as many or as few as you have room for, depending on the size of your shed. 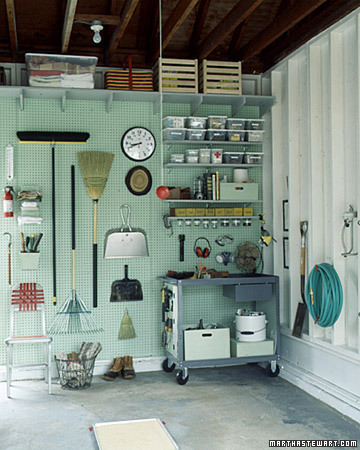 Pegboard Wall Storage: Another idea to keep garden shed tools organized is to install a wall of pegboard. This is available as an option on all of the sheds and garages available at www.FoxSheds.com. You can always paint it to create a cheery interior, as shown on this photo from Martha Stewart. Overhead loft storage or built-in workbench and shelves. There are many creative ways to create an organized system in your custom garden shed. Do you have any ideas you’d like to share? Read more about how to select the right size shed for your needs. Please feel free to contact us directly at www.FoxSheds.com ! Remember that we ship right to you! 10×16 Chalet Shed, Victorian Gable Style Shed Fox’s Sheds – Lititz PA.
Manheim Barons colors of Maroon and Gray! Lovely chalet style shed with maroon shutters and light gray siding. Update: This shed has sold~! I saw a squirrel chasing a nut across the street yesterday, and somehow it struck me as quite ironic. I’ve admitted before that I hate squirrels (and yes, hate is a strong word), but I was too amused with the scene to think about putting the pedal to the metal and making roadkill out of him. No, I would never really do that, and I found myself slowing down to let him cross, as I watched, amused. Who am I to put the brakes on his goals? It was quite funny because this nut was rolling down the hilly street, and this poor squirrel kept catching up, before it would get away from him again. What struck me as ironic is the fact that we are all – squirrels and humans alike – chasing something. It might be a dream, it might be a goal, it might be the basic pursuit of happiness. And when we find that “something”, whether real or perceived, we tend to store it away. But at what point are we content with what we have? Here it is, springtime, and this squirrel surely would have had enough nuts stored away by now over the long cold winter. Yet, here was one more that he just needed to have, risking life and limb and bushy tail as he crossed the street in front of my silver four wheeled nutcracker. How much stuff is too much? How do we keep it safe until we need to use it? It reminded me of when I was actively selling real estate, and buyers and their continued search for that one perfect house – chasing after each new listing and never making a decision. The perfect house is out there, yet the search continues until they’ve exhausted themselves and their agent. When do they stop? It reminded me of myself as an active real estate agent and my continued search for the perfect buyer. The perfect listing. The perfect comission split and the perfect broker. When do we stop? And real estate sellers aren’t left out of the picture either. A seller who has stored all of his nuts into the equity of his home, only to find out that his cache is not worth as much as he thought. Where’d all that equity go? I guess all of these thoughts would not have normally crossed my mind at the sight of a squirrel chasing a nut, but it just happened to be right as I was heading to yet another busy day at work at Fox’s Country Sheds. All my thoughts were on the busy day ahead, helping to run a custom storage shed manufacturing business and helping our customers to select the perfect storage shed for all of their nuts. Ahem…stuff. Thoughts of work, shed sizes, shed styles, “did I get the wholesale price lists out to all of our dealers”, “did we get the skylites on order in on time for the potting sheds”, is so-and-so ready for their delivery, etc., along with way too much caffeine in the morning, sparked this vision of us all chasing nuts. And storing them. ….And thus, you might think I am one (a nut)…… but I’m not. I’m just storing one. Or two. Or several. Just like you are. Maybe I’m not a nut – just a pack-rat. Where else can I keep my endless supply of garden hoses, rakes (at last count I think we have about 5 rakes), shovels, unused flower pots, sprinklers, opened bags of potting soil and peat moss…. you get the picture. But, unlike that squirrely little gray rodent, my stuff is neatly stored in my Heritage garden shed garage. If you ever wonder what type of shed or garage a shed builder has – this is it! I lovingly refer to it as my “sh-arage” a cross between a shed and a garage. After watching this squirrel and his amusing chase, I have to admit ~ I have a newfound respect for that busy little rodent. But, as roomy as my Heritage Shed garage is – squirrels are not welcome!